Hi Steve - Could I ask what tools/techniques do you use to rub down so precisely as to not affect rivets, etc? My usual toolkit comprises of primer (either Halfords red or Games Workshop Chaos Black) sanding sticks, no. 10 and 10a scalpel blades, a small modellers chisel (the type that fits into an exacto knife handle), cocktail sticks (surprisingly good as a light abrasive) and a glass fibre pen (used as a last resort and very very carefully!). I've actually written an article for BRM covering this which I think will be published at the back end of April. However for the moment, the first thing I do is to clean them. This is especially important on FUD/FXD prints as you need to remove the wax residue as otherwise it will rise through the paint over time and make the model look like you've covered it in glitter! IPA or white spirit is good for dissolving the wax but don't be tempted to leave it soaking for too long - I use a cheap ultrasonic bath for around 10 minutes for this. Once done, rinse with water (I give it a light scrub with an old toothbrush and some liquid hand soap) and leave to dry. The next thing I do is to prime the model so that I can see all the detail and I spend a little while studying where the various features are that I'd like to avoid. After than its a case of working around the model with sanding sticks and using one of the other tools to get into areas that would otherwise be hard to reach. For areas with lots of rivets, such as the chassis of the vans, I either use a chisel of no. 10 scalpel blade held vertically to the model and gently rub back and forth (just the pressure of the blade) between the rivets. This is where priming the model first has a second advantage, you can easily see where you've removed material and once all the paint is removed then you're about there. I used the chisel attachment to get in between the outside frames of the earlier fish van as will - the trick is not to let the blade dig in! Some areas just need to have loose material removing (where it has reacted with the wax supports while printing). In these cases, I chop the end off a cocktail stick at an angle and use this to remove the loose (fuzzy) material. I also did the 'W' irons of the wagon chassis using this technique. For something like the Stannier 2P with it's riveted tank side, I found that chopping the end of a sanding stick at an angle allowed me to get in between the rows of rivets and remove most of the stepping. Two additional applications of primer took care of the rest - go over in light coats though is it is very easy to flood the detail by doing this! If you've managed to remove some rivets then Archers rivet transfers are great (if fiddly) for replacing them - the large of the two vans has two replaced rivets but tell me where! After this, I wash the model again and, if necessary, clean out any grooves (plank lines) using the back of a scalpel blade, leave to dry and reprime. Then its a case of going around tidying up any areas that still require attention before moving on with painting, etc. I had a whole host of pictures taken a couple of weeks back covering this. Unfortunately they are not my property so I can't publish them myself (at least not yet). Regarding the sanding sticks, my preferences are the ones sold be Flory Models (5mm wide, medium and fine grits) and Albion Alloys (3mm wide various grits). I like these as they are flexible and less like to flatten curves on the model like a file or homemade sander. Hope this helps, it sounds complicated but really isn't too bad once you've gotten the hang of things. Thank you Steve - I've bought some bits and pieces from Shapeways but have yet to paint them, so this is very helpful. A very cruel close up (the models is c. 66m long!) showing that I've still got a couple of bits to address before this is ready for use as a casting master (and a redesign of the chassis!). Done a bit of work on the CAD for the County but that's for the loco thread when I've got something that I'm happy showing! That's wonderful detailing. If that were an S&D or an SR coach then I'd even be tempted to have a go at hand-painting the lining. Thank you, luckily (for me anyway) the LNER abandoned lining on non-corridor stock in 1928 so I don't have to worry about this one! That said, I do want to recreate the 1938 special set that was refurbished in GNR livery for using with the Stirling single so I'll have to line a couple at some point! A friend on another forum has pointed out that I've got the roof layout slightly wrong! Therefore, I'll be amending the CAD and reprinting this one before using it as a casting master. Lovely job Steve, I look forward to release of the kit!!!! I'm happy to look into other railways stock - I'm not totally LNER bias but (eventually) modelling Hadley Wood on the ECML does skew things a little! Where can I find drawings for LSWR coaches? I've been playing around with some resin casting. 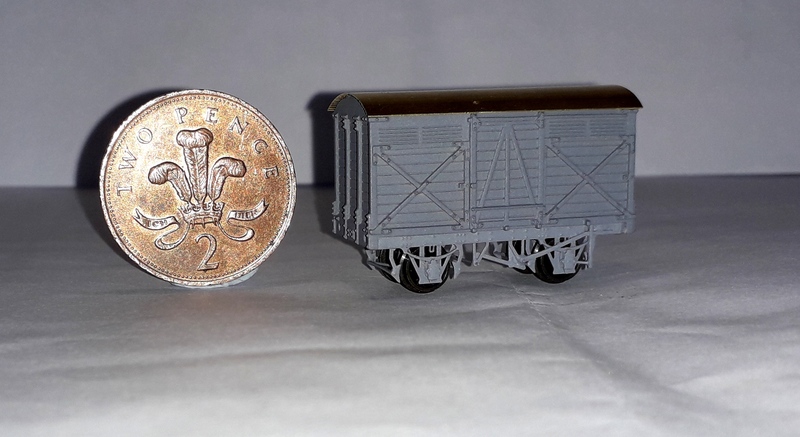 While results have been very promising, the castings have shown that my initial design for the vans could do with some revision to make life easier. Therefore, I've spent a bit of time redesigning these and will be getting another batch of masters printed in due course. However, I have a handful of cast fish van bodies, but no rooves or chassis, and it seemed a pity to not use them. 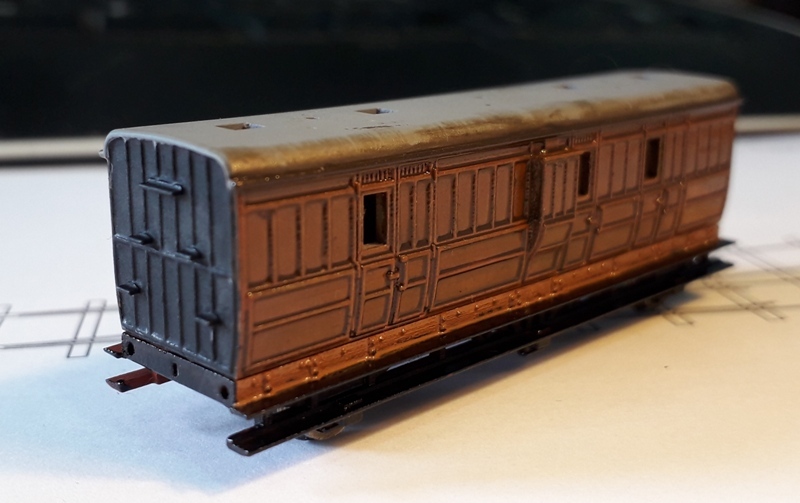 Therefore, I put together a few 2mm Association etched chassis (two in primer drying and one more to be built) and knocked up a roof using BHE etches. The results of the first effort is below. 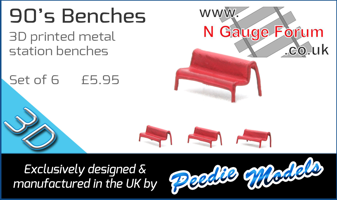 The actual kit will have a mainly cast chassis and roof to make things easier for modellers. If you can get your hands on a copy of 'LSWR Carriages in the 20th Century' by G R Weddell then you'd have all the information you'd ever need. Volume 1 of the same series, 'LSWR Carriages' also has some late Victorian diagrams that could be useful. Plus there are a couple of later volumes that deal with some interesting non-coaching stock. Thank you. That's the really expensive volume isn't it??? I'm going back to Pickering in August, I'll have a look through the bookshop at Grosmont and see if they've got a copy. They can be, but perhaps not if you wait for the right bargain. While I paid £32 for volume 1 (ouch! ), I picked up volume 2 (20th Century) for under a fiver. Actually, volume 1 is available on a certain auction site for £16 at the moment, without a wraparound cover. That's really very good, not to say beautiful!